The chachalacas, guans and curassows are birds in the family Cracidae. These are species of tropical and subtropical Central and South America. One species, the plain chachalaca, just reaches southernmost Texas in the USA. 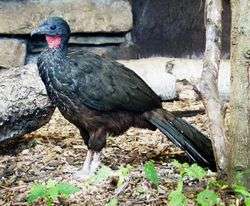 Two species, the Trinidad piping guan and the rufous-vented chachalaca occur on the islands of Trinidad and Tobago respectively. The Cracidae are an ancient group related to the Australasian mound-builders. They are sometimes united with these in a distinct order, "Craciformes", but this is not supported by more recent research which suggests that either is a well-marked, basal lineage of Galliformes. Alternatively, all subfamilies except the Penelopinae could be lumped into the Cracinae. As the initial radiation of cracids is not well resolved at present (see below), the system used here seems more appropriate. It is also quite probable that entirely extinct subfamilies exist as the fossil record is utterly incomplete. Recent research has analyzed mt and nDNA sequences, morphological, and biogeographical data to study the phylogenetic relationships of cracid birds, namely the relationships among the genera (Pereira et al., 2002), the relationships between the species of curassows (Pereira & Baker, 2004) and between the piping- and wattled guans (Grau et al., 2005). 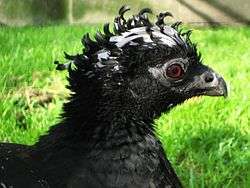 The traditional groups—chachalacas, guans, and curassows—are verified as distinct clades, but the horned guan represents the sole survivor of a very distinct and ancient lineage. In addition, the molecular data suggest that the Cracidae originated in the Late Cretaceous, but the authors caution that this cannot be more than a hypothesis at present: as the rate of molecular evolution is neither constant over time nor uniform between genera and even species, dating based on molecular information has a very low accuracy over such long timespans and needs to be corroborated by fossil evidence. The fossil record of cracids is limited to a single doubtfully distinct genus of chachalaca, Boreortalis (Hawthorn Early Miocene of Florida, USA; may actually be a junior synonym of Ortalis) and some species in the modern genus Ortalis, however. This does not provide any assistance in evaluating the hypothesis (Pereira et al., 2002) that the split between the 4 main lineages of our time occurred quite rapidly, approximately in the Oligocene or slightly earlier, somewhere between 40 and 20 mya. The genera Procrax and Palaeonossax are often considered cracids, but this is not certain at all; they may belong to a related extinct lineage. It is unfortunate that of these too, few good fossils are known, as they date to about the time when the modern groups presumably diverged. Should they be cracids, they are not unlikely to represent either some of the last members of the family before guans, chachalacas, etc. evolved, or very early representatives of these lineages. Thus, the assumption that the modern diversity started to evolve in the late Paleogene, continuing throughout the Miocene and onwards, must also be considered hypothetical given the lack of robust evidence. Still, the "molecular" scenario is entirely possible considering what is known about the evolution and radiation of the Galloanserae, and consistent with the paleogeography of the Americas. The ichnotaxon Tristraguloolithus cracioides is based on fossil eggshell fragments from the Late Cretaceous Oldman Formation of southern Alberta, Canada which are similar to chachalaca eggs (Zelenitsky et al., 1996), but in the absence of bone material their relationships cannot be determined except that they are apparently not from a dinosaur. By comparison, speciation within curassows (Crax, Nothocrax, Pauxi and Mitu) and the piping/wattled guans is supported by better evidence. It was usually caused by changes in topography which divided populations (vicariant speciation), mainly due to the uplift of the Andes which led to the establishment of the modern river basins. The distribution of curassow and piping-guan species for the most part follows the layout of these river systems, and in the latter case, apparently many extinctions of populations in lowland areas (Grau et al., 2005). Another result was that the wattled guan belongs to the same genus as the piping-guans, which thus use the older name Aburria (Grau et al., 2005). Originally interpreted as a turkey by Othniel Charles Marsh, Meleagris antiquus was referred to as Cracidae in 1964 by Pierce Brodkorb. It is nowadays considered unambiguously to be a Cariamiformes under Bathornithidae, and indeed a very different animal from cracids, being a 2 meter tall terrestrial predator. Similarly, Palaeophasianus has been reassigned to Geranoididae, a lineage of large, ostrich-like stem-cranes. Cracids are large birds, similar in general appearance to turkeys. The guans and curassows live in trees, but the smaller chachalacas are found in more open scrubby habitats. Many species are fairly long tailed, which may be an aide to navigating their largely arboreal existence. 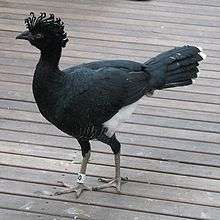 They are generally dull-plumaged, but the curassows and some guans have colourful facial ornaments. The birds in this family are particularly vocal, with the chachalacas taking their name from the sound of their call. Cracids range in size from the little chachalaca (Ortalis motmot), at as little as 38 cm (15 in) and 350 g (12 oz), to the great curassow (Crax rubra), at nearly 1 m (39 in) and 4.3 kg (9.5 lb). These species feed on fruit, insects and worms. They build nests in trees, and lay two to three large white eggs, which only the female incubates alone. The young are precocial and are born with an instinct to immediately climb and seek refuge in the nesting tree. They are able to fly within days of hatching. ↑ Gerald Mayr (2016). "On the taxonomy and osteology of the Early Eocene North American Geranoididae (Aves, Gruoidea)". Swiss Journal of Palaeontology. in press. doi:10.1007/s13358-016-0117-2. 1 2 Rands, Michael R.W. (1991). Forshaw, Joseph, ed. Encyclopaedia of Animals: Birds. London: Merehurst Press. p. 89. ISBN 1-85391-186-0. Zelenitsky, Darla K.; Hills, L. V.; Currie, Philip J. (1996). "Parataxonomic classification of ornithoid eggshell fragments from the Oldman Formation (Judith River Group; Upper Cretaceous), Southern Alberta". Canadian Journal of Earth Sciences. 33 (12): 1655–1667. doi:10.1139/e96-126. Wikimedia Commons has media related to Cracidae.